I try to soak you up when I can. Addicted. You think I am playing when I sniff and inhale, but really I am trying my best to soak you up, to make you last. The snotty, toasty, chocolately smell of you. I wish I could bottle it up to bring out when I am an old woman. I’d be able to unscrew the lid and close my eyes, and there you would be. The warm sweet smell of milk and drool. I’ll close my eyes and open my arms and there you will be again, your chubby wet cheek pressed against mine, snot and dribble stretching from you to me, your ear and the way your red gold hair curls around it, and that fuzzy stiff bit that sticks out straight at the back. I’ll be able to feel your little fat hands gripping and pinching my skin. I’ll breathe in and out and I’ll smell the cheesy sweat in your neck, the damp of your nappy. As for now, I do my best to hang onto you. But you are moving so fast. Snotgoblins are fascinating. A future unwritten, all that potential, all that possibility. Everything you were, and are, and will be. What were you? You were an idea before you existed. You were a thought, a longing, a need, a want, an instinct. You were an ache in my womb. You were a dream at night, a wish in the day. Then you were a line on a stick. A positive. You were something. You were sick in the toilet bowl, and tenderness in the breasts. You were the taste of coffee changing. You were a possibility, a hope. You were tiny, you were alien, you were basic and primitive and roaring to life. You were a black and white image. You were snapped in time. You were my stomach writhing and twisting and changing shape. You were swollen ankles and heartburn. You were a boy or a girl. Healthy, or sick. You were everything. What are you? You are a creation, a sticky mess, a mewling dependent, a cry in the night. You are heavy in my arms and in my heart. You are small hands in mine. You are some of me and some of him and some of them and some of you. You are big blue eyes and strawberry blonde hair. You are eating crayons and throwing cups. You are not like us, not yet. Not defined by rules, tradition or culture. Not narrowed down or constricted or affected. Not weighed down or strung out or lying low. You are all the wonderful gentle vibrant potential of human life. You are what exists before it all starts to go wrong. You are bright and shiny. Your hands are soggy. You feet are stamping. You are full of everything and yet you know nothing. You live on instinct alone. What will you be? It can’t be predicted. Is it already written? Do you have a destiny or a path? What is around the corner as you grow? What walls will you hit? What disappointments will you face? What triumphs will be yours? We can’t say what you will look like, we can’t know what you will be like, we can’t guess what you will become. You are a mystery in snotgoblin form. A book waiting to be written. A song waiting to be sung. You could be anything, anyone. But just for now, just for today, just for the smallest, briefest, sweetest moment in time, you are mine and you are in my arms, with your head on my shoulder, and I can smell your snotty, mucky smell, I can smell your day, and your fun, and I can feel your heart beating, and for just a second, you are all mine. I quite like that smell! it’s beautiful; earthy like an egg on toast. actually you do know it, the warm sweet smell and the fuzzy bit that sticks out at the back prove you do. I can’t get over you calling him ( from the picture) a Snotgoblin and can only surmise that for you it is a term of affection in keeping with the angsty characters of your novels; this after searching back through your thoughts for those words of appreciation and wonder to put it into context. Snotgoblin-arrrgh! Haha! It was actually a word a Facebook friend used when commenting on something I had posted about the little man. It summed him up perfectly. Teething and constantly snotty! 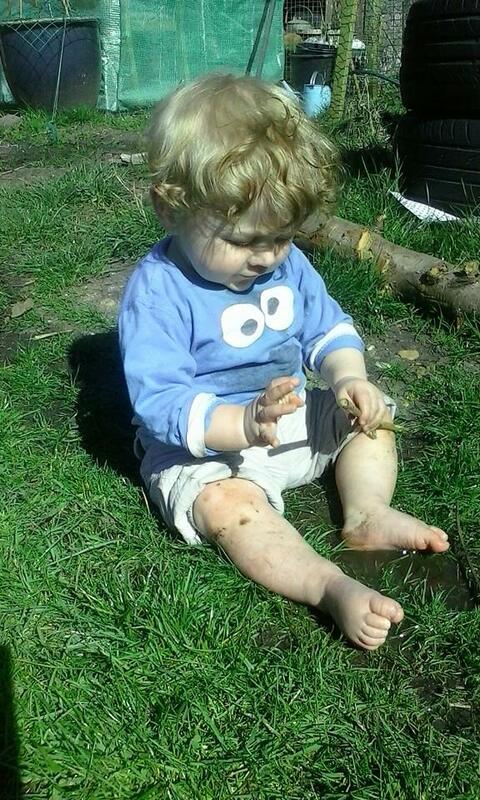 Loves being outside and is always into something mucky!